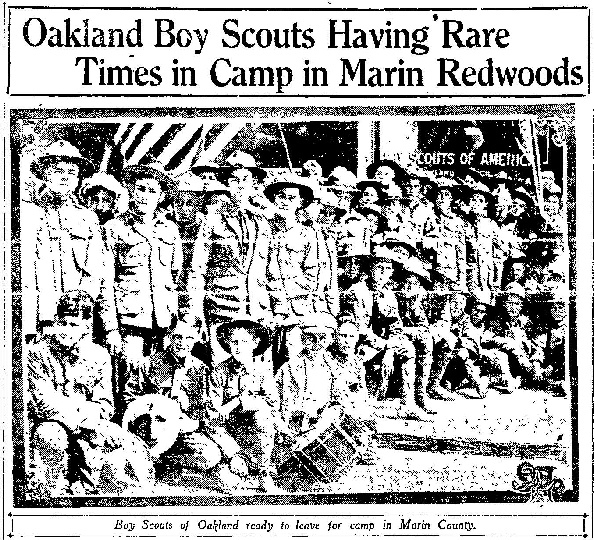 The very first summer training camp run by the Oakland council was attended by seventy-five Scouts and leaders. The camp was held in June of 1917 for two weeks and was located about three miles West of the town of Lagunitas in Marin County along the Lagunitas creek and near the North Coast Pacific railway lines. The area that was used was known as Camp Taylor and is now known as the Samuel P Taylor State park. The Scouts met at the council headquarters at 404 Eleventh Street in Oakland with their dunnage bags and blankets. The group was transported by two motor trucks to Richmond point where they crossed over to San Rafael via the automobile ferry to San Quentin Point and then over to Lagunitas. The Scouts were dropped two miles from camp at the mouth of the Lagunitas canyon where one truck would haul the boys to camp while the other truck went for straw to be used in the boys' sleeping area. The Scouts constructed a model camp using an old logging camp and cabin as their headquarters and nine tents for their houses. After inspection of the tents, a scheduled program of events and directed activities in work and play kept the boys constantly on the go. After the camp fire of entertainment and singing, the boys were ready to turn in for a night's sleep. 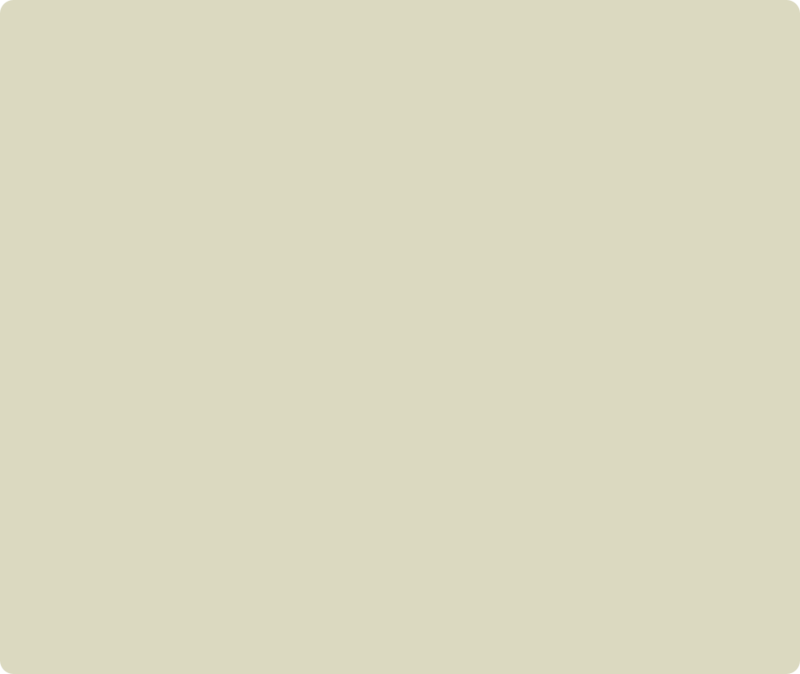 In charge of the camp was JH Pfund-scout commissioner, H Richard Wilson-Scout Executive along with a number of scoutmasters. Special instructors from the University of California and local scoutmasters came up during the weekends to teach the boys woodcraft, scouting and various stunts. 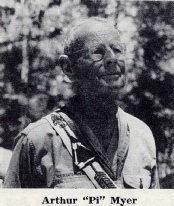 Arthur H. Myer (who was the first Eagle Scout in California from the Fresno Council) provided instruction in astronomy and first aid to the Scouts. Howard Becker of the University of California was in charge of the nature program as the nature director. It is interesting to note that Arthur Myer would eventually become a fixture at Camp Royaneh, would help organize Royaneh Lodge in the 1940’s as well as at the age of 87, help cut the ribbon during the dedication ceremonies for the San Francisco Bay Area Scout office in 1974. No accidents or sickness was reported in camp however requests for chocolate cake and an appreciation for home food was expressed in daily cards mailed to parents. The camp store supplied confectionary, stationary, scout equipment and served as a field hospital was said to be the most popular place in camp. The boys were divided into three companies — red, white and blue. Each of these companies (or Troops) were then divided into four patrols of eight boys each, with a patrol leader and assistant, who was responsible for the conduct and safety of the boys. Special camp certificates were awarded for boys making a certain grade in their conduct and nature study. Each boy was required to identify every possible natural object in order that he may have a large scoring certificate for having discovered the different species and classes of shrubs, plants, mammals, fish and insects. Since the camp was in duration for two weeks, many parents and visitors were welcomed for the weekend. The scouts planned an entertainment for the Saturday night campfire and labor to hew out an ideal camp in anticipation of these visitors.